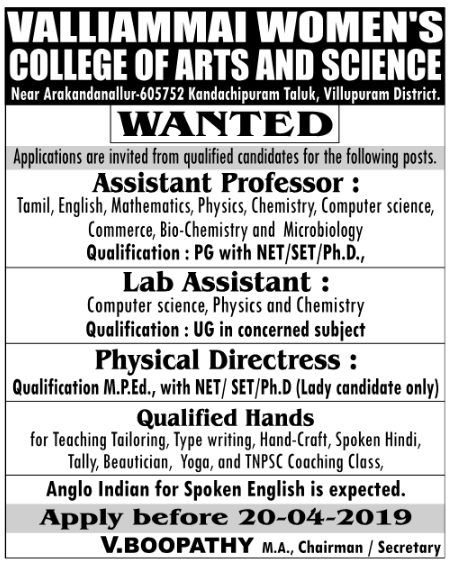 Valliammai Women's College of Arts and Science, Villupuram has advertised in the DINAMALAR newspaper for recruitment of Assistant Professor / Physical Directress / Lab Assistant jobs vacancies. Interested and eligible job aspirants are requested to apply on or before 20th April 2019. Check out further more details below. About College: With a noble ambition to promote and propagate women's education and with a sense of concern and commitment to the society at large, VALLIAMMAI WOMEN'S COLLEGE was started during the year 2010 – 2011 by the philanthropic minded Trustees of VALLIAMMAI EDUCATIONAL and CHARITABLE TRUST , CHIDAMBARAM. The College is situated at Tirukoilur to Villupuram Main Road, Near Arakandanallur – 605752, Tirukoilur in 10.50 Acres of land. The College has adequate building , Furniture and other infrastural facilities as per the norms of the THIRUVALLUVAR University to which the college is affiliated. How to Apply: Interested candidates are requested to send both hard copy and soft copy along with copies of certificates, passport size photograph, PAN card Xerox and Aadhar Card Xerox to the postal address or email address provided below.